I'm an ice cream guy, through and through. There's nothing like a refreshing scoop of Ice Cream to help beat the Philippine heat. Whether it's a simple Pinipig Crunch or a bar of Magnum, papatulan ko yan. I've been quite pleased with the Gelato places that have been popping up around the metro. I do have a few favorites that I would go to whenever I get the chance. I honestly felt that these Gelato makers were easily among the best I've ever tried. Whenever someone would ask me where to get some good ice cream, I would rattle off names of Gelato places and the flavors that they should get without batting an eyelash. That was until I visited Bono Artisanal Gelato and realized everything I thought I knew about Gelato was wrong. Be careful when going to Bono Artisanal Gelato in SM Makati. It's at the spot immediately after the bridge linking Glorietta and SM, so if you're not careful, there's a chance that you might actually walk past it, like I did. How I overlooked it, I have no clue, considering its adorned with bright colors and lights, making it nearly impossible to miss. I made sure that we got the table near the wall, which featured the basics of Gelato 101. Which was totally unnecessary, because I met up with Bono's co-owner Rea, and she took Rina and I through a trip down memory lane on how Bono came to be. And it actually is quite a fascinating story. 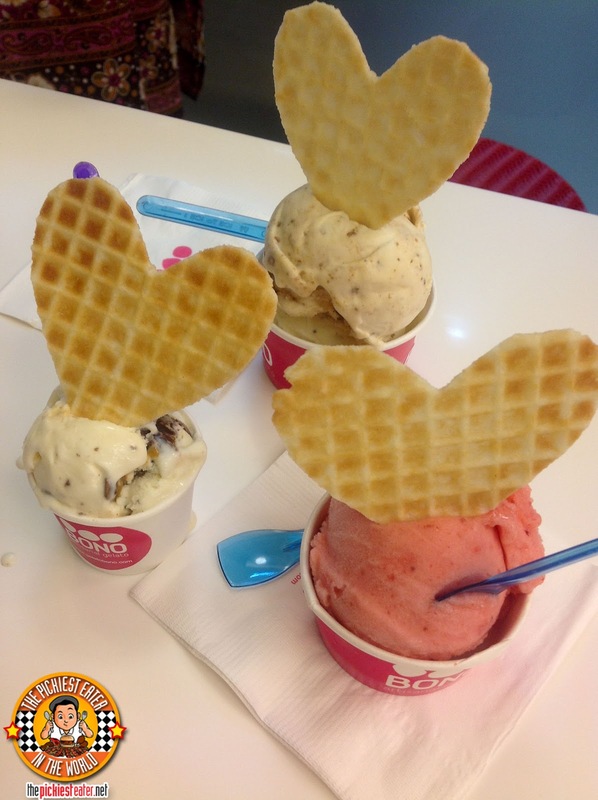 Rea and her partner Zarah went to a "Gelato University" in Italy. I'm not making that up. There's an actual Gelato University in Italy (I googled it. It's legit. ), where they learned the craft of making Ice Cream the Italian way at Carpigiani University in Bologna, to be more precise. Rea and Zarah decided to use what they learned to bring a Gelateria to the Philippines, that would set itself apart from the usual gelato places that the country has to offer, by offering something that the others don't. Let me explain. I'm not saying that the other gelato places are fake, but Bono Artisanal Gelato doesn't use any artificial ingredients or mixes. There are absolutely no shortcuts here. Their strawberry gelato look rather pale as compared to Magnolia ice cream. Why? Because there are no artificial coloring added. All you get is the natural shade of strawberries mixed with the milk, creating a soft pink hue. This is the way the pros do it in Italy, and Bono takes pride in the fact that that is the way they do it there too. Rea let us into their Gelato Laboratorio, which is actually glass paned, giving the viewing public a chance to see how their Gelato is made. I walked in, half expecting something Willy Wonka-esque. But instead, I was faced with two machines that looked more suitable for time travel than for making ice cream. Apparently, I was in the presence of a "Cattabriga Effe".. A Vertical Gelato Freezer that is considered the Rolls Royce of Gelato machines. Rea's crew was just in the middle of making a fresh batch of Oatmeal Cookie Gelato, so we got a first hand look of the process that the ice cream goes through. She showed me the bowl where the oatmeal cookies were placed, and the raisins were still whole to ensure that the full flavor was still intact. To avoid any technical mumbo jumbo, I'm going to describe to you how the Cattabriga Effe works based on what it says on their website hehe.. The machine’s vat turns and the mix moves towards its cold inner side, where the water changes into ice crystals, giving a deep structure to the liquid mix; consequently, a special “spatula”, with a delicate and discontinuous movement, removes and spreads the product in a stainless steel surface. While freezing, the mix incorporates air in a natural way and takes a creamy consistency. The only thing the Bono crew member needed to do was drop in the bits of Oatmeal cookie and Raisin, and pretty much the machine did all the work. The product took shape and fragrance as the unit is freezing. One huge difference that Bono has from its competitors, is that it refuses to put its ice cream out on display. If you want to see what the ice cream looks like, the crew member would have to pull it out from the "Pozzetto Cabinets" in which it is stored in. The Pozzetto cabinets ensure the least amount of air & light contamination while also preserving a constant temperature. Makes sense, doesn't it? Forgive me for the long intro, but learning about how gelato is made was an eye opener for me. But more importantly, I wanted to see if the entire process actually made a difference in the taste. Even though I had just seen Bono's Cattabriga Effe with my own eyes, the first scoop of Speculoos gelato I put into my mouth made me believe that this ice cream was churned by angels. I could not get over the silky texture. It was unlike anything I had ever tasted before. I told Rea, that I had never had gelato this smooth in my entire life. She couldn't help but let out a small laugh, and replied, "Because THAT is Gelato!". I'm a huge fan of Cookie Butter, so this Speculoos flavor was absolutely mind blowing. It had bits of little cookies in it, with the cookie butter not just slapped on to the ice cream and mashed in, but instead, is rigorously mixed into the milk base before being frozen. The bits of biscuit gives it a bit of a crunch, as well. Easily the best cup of ice cream I've ever had the chance to devour taste. Rina ordered the Cereal and Milk, which she loved. When eating a bowl of cereal, her favorite part is when she's out of cereal and all that is left in her bowl is the milk that has soaked in the flavor of the cereal. That's pretty much what Bono uses as the milk base. Such a novel idea, yet brilliant at the same time. After we finished our cups, Rea took Rina, Baby Rain and I behind the counter to sample their other flavors. Everything was nothing short of phenomenal, with my personal favorites (Apart from the Speculoos, of course) being the "Mad about Malt" which was Malted Milk powder with Maltesers, and the "Movie Night", which was chocolate dipped potato crisps. The "Movie Night" flavor was memorable to me, because this actually tasted like a potato chip dipped in chocolate, yet it worked perfectly. Every single flavor we tried, such as the Pistachio, Fragola, and even the Lavande were nothing short of amazing. This was an incredible experience for me.. I really felt like a kid at a candy store, getting to try so many flavors of delicious ice cream! but I can say with all sincerity that I mean it when I say that Bono Artisanal Gelato is THE BEST Gelato I have ever tried. I want to cry while reading this. I'll be around the area later (as of this writing), but I still can't try it because I still have the cough. Darn it!!!!!!!!!!!!!! OMG!!! The speculoos is AMAZING! Love their other flavors, too, but the speculoos is AMAZING! A bit pricey, but you're paying for quality, and the SPECULOOS IS AMAZING! I always get my bono gelato in a cone, and the SPECULOOS IS AMAZING when you eat it out of the wafer cone. But I agree with you 1 billion percent inaki! SPECULOOS IS AMAZING!! It's quite incredible, Justinne! When ya come to manila, I'll intro you to the owner so she can take you on a tour so you can blog about it as well! Their place looks so nice! I love the bright colors. Gelato is something I really like as well. I'm going to keep this place in mind, thank you for sharing. It's because of this blog post that I visited this gelato place last week. And I almost missed it too because every time I enter SM from Glorietta I always take the left direction and it's in the right. Thanks for sharing! Will link you up when I write about my visit there. You are most welcome, Leah! I'm glad you enjoyed! Thank you for the mention.. I really like your blog! Looking forward to reading more of your posts! I would like to work in BONO LABORATORIES. I think I will be dead happy if I get to be their lab rat. hahaha!